Whitman College students volunteered in Walla Walla, Wash., classrooms to teach the next generation about historic episodes in the Civil Rights Movement. The 2011 Southern Poverty Law Center education report graded the states on what they require public schools to teach about a nation-changing era—the Civil Rights Movement. Thirty-five states flunked. After the report, titled “Teaching the Movement: The State of Civil Rights Education 2011,” revealed the state of civil rights education, only one college contacted the author. That college—located in a state that received an F—is a small liberal arts institution in an isolated region of southeastern Washington, best known for growing sweet onions and having scores of wineries. The upshot of the email exchange and follow-up phone conversations is a pioneering educational program that Whitman College launched with the local school district in Walla Walla, Wash. This February marked the third time that Whitman students volunteered in Walla Walla classrooms to teach the next generation about such historic episodes as the student sit-ins at a lunch counter in Greensboro, N.C., and Martin Luther King Jr.’s letter from the Birmingham, Ala., jail. The “Teaching the Movement” report was published in September. Noah Leavitt, assistant dean for student engagement at Whitman, contacted Shuster in November. By January 2012, Whitman students were teaching civil rights lessons to Walla Walla students, relatively quick for ramping up a new program at a college. The Walla Walla school district considers the groundbreaking program “a successful partnership,” says Dr. Linda Boggs, assistant superintendent for curriculum, instruction and assessment. The project, called Whitman Teaches the Movement, is being expanded this year. 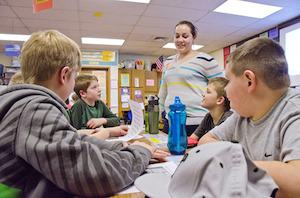 In late January, Whitman students provided lessons to students in a second district, Dayton, in an adjoining county. Leavitt is making plans for additional educational programs about the Latino farmworker movement around César Chávez Day in March. More than a third of Walla Walla’s 6,000 students are Latinos, the district’s largest racial-ethnic minority. Both Leavitt and Shuster are hoping Whitman’s model inspires similar partnerships between colleges and school districts around the country. In late January, representatives from 10 colleges in the Pacific Northwest attended an information session that Whitman hosted. Leavitt says all expressed interest in replicating the WTTM model on their campuses, including the University of Washington, a regional heavyweight, and Reed College, a noted liberal arts college in Oregon. Shuster, who is working on an updated report on civil rights education for the Southern Poverty Law Center, has spotted evidence that some states are getting the message. She cites as examples Oklahoma, whose new history standards do “an exceptional job” on the movement, she says; and Utah, which offered broader professional development on teaching about equity and social change. The progress in those Western states with small Black populations deviates from the regional patterns Shuster documented in the 2011 report. The report compared state curriculum standards with the “minimum core content” on the Civil Rights Movement that experts recommended to the Southern Poverty Law Center. For example, teaching about King and Rosa Parks was required, along with six other movement leaders of the state’s choice. The report did not assess whether some districts, like Walla Walla’s, went beyond state standards and provided additional lessons about the era. Of the three states to receive an A, two were in the South: Alabama and Florida. New York was the other. Two of three states to earn a B were also Southern: Georgia and South Carolina, joined by Illinois. Many resources are readily available for other states to do a better job teaching the movement’s history. That’s one reason the Whitman-Walla Walla project was able to get underway so quickly. From a book on her shelf, Shuster pulled one lesson plan. Designed for seventh-graders, it explores the role of women in the movement. Shuster developed two other lessons from a picture book or a teacher’s guide—one for second-graders about Jackie Robinson integrating Major League Baseball and another on the Greensboro sit-ins for fifth-graders. Shuster’s own work. This year, Walla Walla teachers revised that lesson plan to make it more interactive. Students at both Whitman and Walla Walla say they have gained new knowledge. Before coordinating the program last year, Sophie Schouboe, who will graduate in 2015, taught second-graders in 2012. Learning factual information is only part of the project’s purpose. Both Leavitt and Shuster say the goal is for Whitman and local students to glean broader lessons as well. Of Whitman’s 1,500 students, 72 percent are White, 8 percent Hispanic, 7 percent Asian-Pacific Islander and 1 percent Black. The rest are mixed race or international or do not specify their race. The lessons of the Civil Rights Movement, says Shuster, on behalf of the Southern Poverty Law Center, are one for college and K-12 students throughout the country.